I can’t believe it’s June already! Part of me is looking forward to summer but the other part of me wishes I had eaten better over the past few months. Hot weather means less clothing and it’s hard to cover up, if you know what I mean. Vanity aside, running long distances with extra weight isn’t easy either. It can be hard on your joints and you use more energy to run fast. This month is a good time to start eating clean so you can fit into that new swimsuit. So let’s kick things off with a recipe using quinoa. Quinoa (pronounced KEEN-wah) is a grain that has a soft fluffy texture when cooked and somewhat of a nutty flavor. It is high in fiber, protein, magnesium and iron. I first had a chance to try quinoa a few years ago when I stayed at Disney’s Animal Kingdom Lodge. For breakfast, the staff had set out a pot of quinoa next to a pot of oatmeal and they explained that quinoa was often eaten as hot cereal in many cultures – you can dress it up just like oatmeal with fruit and a pinch of cinnamon, only it has much more protein. I was immediately hooked! 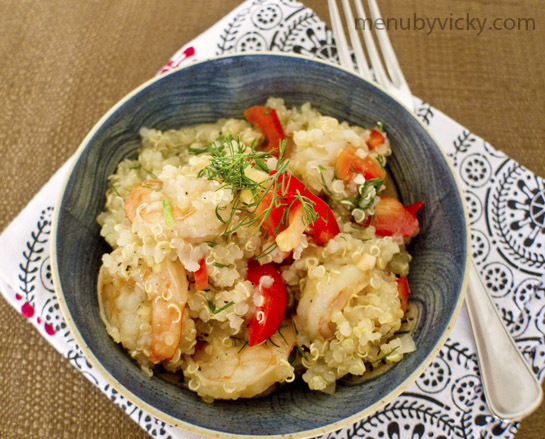 I found this recipe for Sweet Ginger Shrimp with Dill & Quinoa in an old issue of The Running Room magazine. It’s simple to make, and I sometimes double the quantity so I’ll have extras for lunches during the week. I normally take a serving with me for lunch along with a container of mixed salad greens, a handful of baby carrots and an apple, and I’m set until dinner. What are some of your favourite activities to get in shape? Heat the vegetable oil in skillet over medium heat. Cook onions, stirring for 2 to 4 minutes until lightly brown. Add ginger, lime zest and black pepper. Cook for about 30 seconds, stirring until ginger and garlic are fragrant. Add shrimp, stock, lime juice and honey. Cover and cook for about 5 minutes, stirring once (scraping any bits from bottom of the pan), until shrimp are pink and cooked through. Remove from heat. 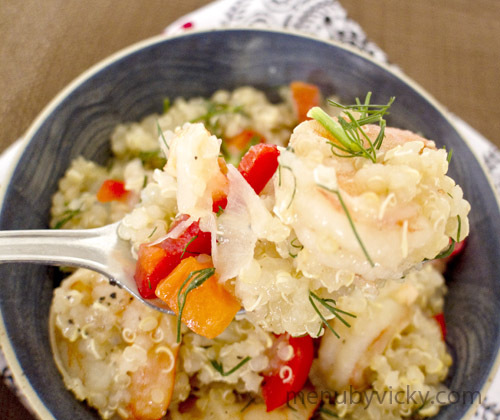 Toss prepared quinoa with shrimp mixture, add in dill and peppers. Recipe notes: If you buy your quinoa from the bulk store and there are no cooking instructions, it’s a 1:2 ratio of quinoa to water. So for this recipe it’s a 1/2 cup of quinoa to 1 cup of water. You bring it to a boil, and the simmer for about 7-10 minutes. It took me about 8 minutes to finish cooking. Don’t forget to soak your quinoa in water before you start cooking. It helps to get rid of any coatings on the seeds. If you’re not a fan of shrimp or are vegetarian, you can easily swap out the shrimp for cubed tofu (extra firm). This does look tasty, I like the flavor elements you chose for this. Also, it is very healthy and well rounded. Glad you posted this-enjoy the day! This sounds delicious! I love the combination of ginger and dill. Such a great recipe to keep you slim for swim season! I really like this recipe! Ginger is one of those things I never liked growing up but really enjoy the flavor now. I love quinoa recipes! I buy it in bulk. I can’t wait to enjoy this recipe! We have a trail/sidewalk that runs along the bay beside my house. I love riding my bike up and down it or walking, unfortunately I can’t run because of a previous knee injury. But it is so beautiful that it doesn’t feel like exercise. If you try it, let me know how it turns out. Your trail sounds awesome! I wished I lived closer to the water. This looks perfect, I’ve yet to try Quinoa because it’s quite hard to find where I live. The flavour of this dish sounds amazing though, is it filling? Hi Emma! You might be able to order quinoa from an online retailer. I find it filling but I usually have sides like a salad and some raw veggies with it. I think it might be okay in the summer alone but I’d probably want some sides in the winter when I have a larger appetite.